Designed for trekking and hiking, the Elaho is light, airy and built to handle the unique demands of extended backcountry travel. Made from Alatorre™, a technical fabric selected for its light weight, airiness and durability, the Elaho offers air and vapour transport, quick drying performance and resists pack abrasion. The Elaho’s use-specific design does not come at the expense of versatility. 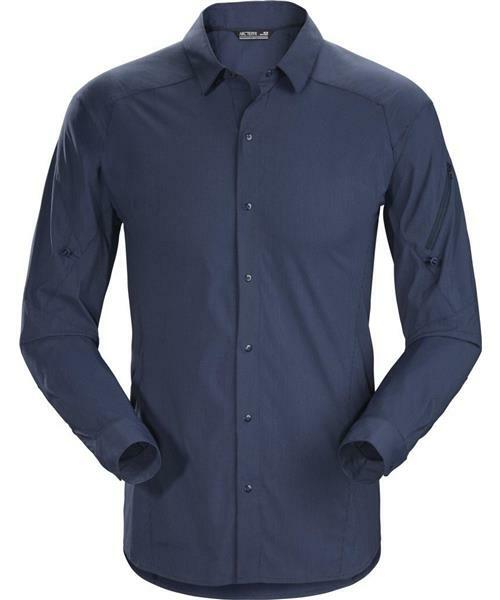 Its performance combines with a classic snap-front style that makes it a great shirt for travel and casual wear. Arc’teryx designs with movement in mind. The Elaho’s patterning and fit encourage airflow and unrestricted motion without adding excess material that can get in the way or generate irritation under pack straps. Gusseted underarms, articulated sleeves and the fabric’s mechanical stretch further elevate freedom of movement. As a component of the Arc’teryx Traverse collection, the Elaho works as part of a comprehensive system that combines footwear, packs and apparel to deliver Arc’teryx freedom of movement, performance and reliability. Arc’teryx is known for distilling its designs to put the focus on purpose and function. The Elaho is simple and smart. In addition to advanced materials and ergonomic construction, careful feature selection elevates performance without encumbering design. A small zippered pocket is placed on the shoulder for accessibility while wearing a pack. Long sleeves offer protection from sun and scratches, and, as weather warms, easily roll up and secure with a button to keep them out of the way while traveling. All of its elements combine in a versatile shirt that weighs just 175 grams.